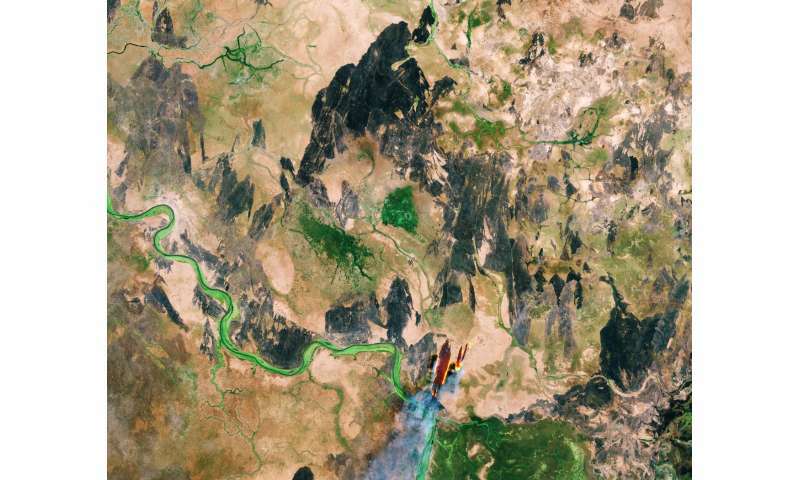 The Copernicus Sentinel-2B satellite takes us over South Sudan. Having gained independence from Sudan in July 2011, South Sudan is the youngest country in the world. It has an estimated population of 13 million people, more than 80% of whom live in rural areas. Most of the population relies on farming, fishing or herding to meet their food and income needs. The Sobat river is traced in a vibrant green colour along the left part of the image. This is the most southerly of the great eastern tributaries of the White Nile, the section of the Nile between Malakal, South Sudan and Khartoum, Sudan. Tropical forests, swamps and grassland make up the majority of South Sudan's terrain. A large, swampy area called the Sudd, which is about 320 km wide and 400 km long, can be found in the centre of the country. This is thought to be one of the largest freshwater ecosystems in the world and is fed by the White Nile and rainfall runoff from surrounding areas. It is home to large fish populations, millions of migratory birds, and various endangered species. The area has also provided shelter for refugees fleeing the ongoing Sudanese civil war, which broke out in South Sudan in December 2013. The red and gold in the lower-central part of the image shows smoke from a fire. The smoke is being driven by a northerly wind. The black parts of the image, similarly, show burnt areas of land – possibly the result of slash and burn agriculture. By burning dry grass, herders are able to fertilise the soil with ash, promoting new growth that can be used to feed livestock. Subsistence farmers also tend to use this method to manage land, returning nutrients to the soil and clearing the ground of unwanted plants in the process. Some of the negative longer-term impacts of this practice include air pollution, deforestation and erosion. Sentinel-2 carries an innovative wide swath high-resolution multispectral imager for observing our land and vegetation. The mission mainly provides information for agricultural and forestry practices and for helping manage food security.